Don’t worry about the supervillain doing something bad in your house, another superhero planter will always keep an eye on the bad guy who has a plant on his head. Cool? Let’s keep checking the two handmade planters. 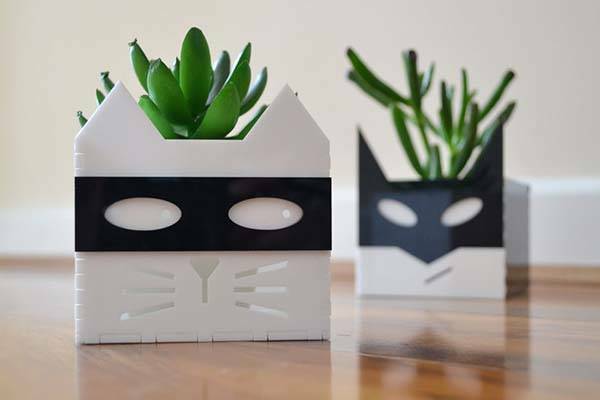 These are two practical and pretty cute planters inspired by superhero and supervillain, and handmade by Erinnies, a crafter from the UK. As shown in the images, one planter looks like Batman, and another should be a new cat-like supervillain who just caught Batman’s attention in Gotham City. Both planters show off adorable detailing, and portable design allows you to place them anywhere in your house. Both planters are made out of black and white acrylic. Each measures 3-1/2 x 4 inches (8-1/2 x 10cm), and it can hold a plant pot that is approx 3 inches high by 3 inches wide, so both pots perfectly fit for various small planters like cactus, succulent, and more. 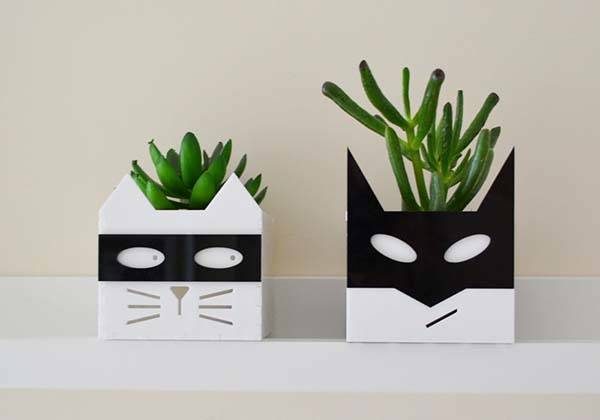 The handmade superhero and supervillain planters are priced at $18.45 USD respectively. If you’re interested, jump to Etsy for its more details.